EAD & Associates, LLC is proud to present our award-winning tool designed to help people take important steps to being better prepared for emergencies and disasters. Each wheel differs slightly to provide customized information to the targeted use. Learn the Basics of Preparedness using a practical approach that is easy to follow. You can build a great plan over time. Each tool has space for the user to write their personal information down including emergency contact information, doctors, critical services, schools, as well as medical information such as allergies, medications, and medical/assistive equipment. Add your logo or pictures! Customize the Wheels just for your family, community, organization, and/or agency. For a nominal fee, you can add your logo, pictures, or other information to the space at the top of the wheel. Just ask our sales associate about this feature. The Emergency Readiness Wheels are reasonably priced as we are very interested in getting the preparedness message out into communities. For pricing information on the wheels please contact us. ...just to mention a few. Community members with disabilities, seniors, and/or their families and caregivers, those that directly work with people with disabilities or seniors. This workshop is designed to bring the preparedness message to community members and help to get individual planning underway. This is done through a combination of presentation and activities all geared towards development of individualized preparedness plans for members of your community. Utilizing EAD's unique preparedness tool, the Emergency Readiness Wheel, the workshop facilitator will talk about useful and practical ways to get prepared. The content of the course is geared towards persons with disabilities, seniors, and/or their families and caregivers. This session has helped to get thousands of people prepared and has been taught in communities throughout the Gulf Coast region and in California. Better prepared individuals mean better prepared communities!! The workshop can accommodate one or multiple agencies at the same time. EAD offers a valuable and unique approach to emergency preparedness that is geared towards people with disabilities and seniors. This seminar prepares leaders and agency trainers to bring the emergency preparedness message to people with disabilities and seniors in their communities. Built upon a community empowerment model, EAD believes that an informed public can make their communities stronger. Utilizing EAD's Emergency Readiness Wheel, seminar participants will learn how to use the wheel as a tool and walk through critical preparedness steps with community members. These steps include: doing a personal assessment, forming a personal support network, making a ready kit and go bag, creating emergency lists and identifying emergency information resources, as well as planning for evacuation, shelter, and service providers. The course also will address information about adult learners and adult learning best practices as well as tips for creating a fully accessible learning environment. 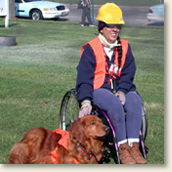 This course has been successfully taught in Mississippi, Louisiana, Alabama, and California and has led to thousands of people with disabilities and seniors getting the preparedness message. The Communication Picture Board was designed to help bridge the communication gap between emergency first responders and people who are deaf. The picture board is proven to also effectively enhance the communications needs between first responders and non-English speaking populations, children, people with developmental disabilities, as well as those impacted by a traumatic event. These boards are helpful in a variety of settings, in the field, on an ambulance, in a shelter, at an assistance center, etc. Additionally, the boards are printed with the ink directly impregnated into the plastic as a single process – it is not laminated and can not come apart. Therefore, the integrity of the board can be maintained and long-lasting, even through a process such as decontamination. The Communication Boards contain pictures with a word describing the picture underneath in both English and Spanish. Further on the back of the board, several languages are listed so that non-English speakers can identify their language if other than English. The Boards can be customized to meet your needs. To learn more or to order these boards, contact our office at mail@eadassociates.com or use our contact form. Westcot Specialized cots that are designed and engineered to meet the large scale special medical needs of the frail, disabled and injured in times of civilian evacuations or military operations. This product was developed by responders working with mass sheltering in Florida during Hurricane Andrew and solves many of the difficulties associated with low to the ground, unbalanced traditional cots. This is both a wheelchair transfer height cot suitable for use in shelter operations and a medical bed suitable for use in alternate care facilities or operations. U.S. Patents: No. 6, 151, 730. Safety: Personal safety system spring loaded deck cradles the patient. For more information, contact westcots@bellsouth.net. The University of New Mexico's Center for Development and Disability, developed tip cards for first responders who work with a range of people with special needs. Many first responders have requested quick, easy-to-use procedures for assisting people with disabilities. These tip cards provide information about many types of disabilities you can use during emergencies as well as routine encounters. They are not meant to be comprehensive, but contain specific information that first responders can read quickly either before or while you are actually responding to an incident. Weather radios equipped with a special alarm tone feature can sound an alert and give you immediate information about a life-threatening situation. During an emergency, National Weather Service forecasters will interrupt routine weather radio programming and send out the special tone that activates weather radios in the listening area. The hearing- and visually impaired can get these warnings by connecting weather radios with alarm tones to other kinds of attention-getting devices like strobe lights, pagers, bed-shakers, personal computers and text printers. You can buy NOAA Weather Radios at electronic stores or call the National Weather Service office closest to you. To learn more, visit http://www.weather.gov/nwr/nwrback.htm. As part of a consumer survey of the Nobody Left Behind: Disaster Preparedness for Persons with Mobility Impairments project, survivors were asked about tips for getting out of harm's way during a disaster or an emergency situation. 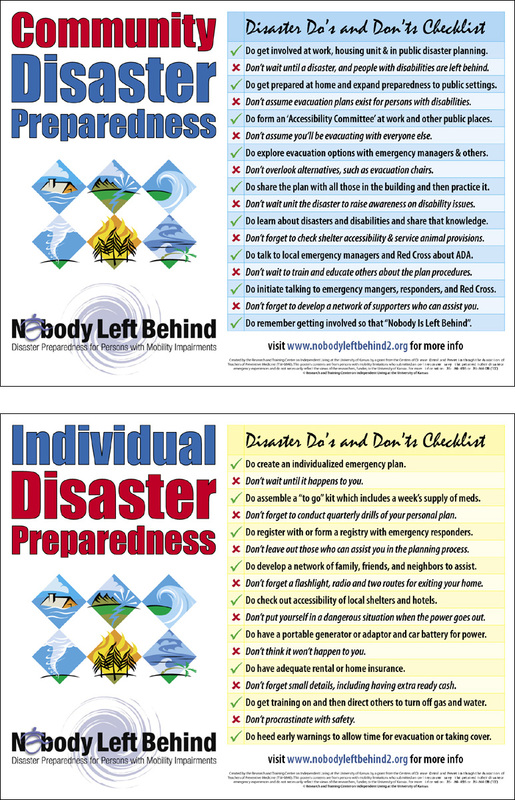 Based on their responses, these two attractive educational 18" x 24" Do's and Don'ts Checklist Posters were designed to encourage individual disaster planning and community level planning for persons with mobility limitations. (Microsoft Word document – 1.3MB).